Vijay Shankar grabbed the much debated No. 4 slot and Dinesh Karthik will board the flight to England and Wales as second wicketkeeper in the 15-member Indian squad for the ICC World Cup. Ambati Rayudu who was team think tank’s preferred No. 4 choice before Shankar came into the mix, surprisingly missed out along with talented youngster Rishabh Pant. 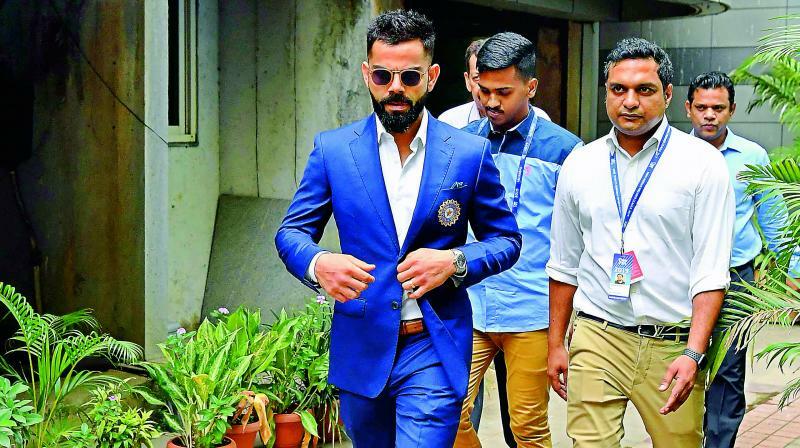 Ravindra Jadeja was also persisted with as third slow bowler and all-rounder as MSK Prasad led five-member selection committee with Virat Kohli in attendance picked three specialist seamers with allrounders Shankar and Hardik Pandya here on Monday. Karthik who has been with the team on a regular basis especially after the Champions trophy was preferred over Pant on the basis of experience, better keeping skills in tense situations and his ability to finish the games well under pressure. Pant had done well in Test cricket with the bat but he couldn’t grab his chance in white ball cricket. The youngster’s glove work behind the stumps left a lot to be desired. Shankar got the go ahead over more accomplished Rayudu on the basis of his bowling skills and ‘fantastic fielding’. Four more medium pacers are set to travel with the team as injury backups. K. L. Rahul will be the reserve opener in the side initially though he can fit in No. 3 or No. 4 slot if Shankar gamble doesn’t work. Rest there were no surprises as Virat Kolhi will lead the side for the first time in the World Cup. Rohit Sharma will be his deputy and will open the innings with Shikhar Dhawan. Kohli is the No. 3 though he may shift to No. 4 position if the situation demands. Shankar, Kedar Jadhav and M. S. Dhoni form the middle order. Hardik can play the role of a finisher with the bat and contribute with the ball in seaming conditions. Prasad made it clear Shankar wasn’t picked due to Hardik’s back injury concerns. “Hardik’s back injury was not that bad. Just as a precautionary note and taking World Cup into consideration we had given him break,” he said. Yuzvendra Chahal, Kuldeep Yadav and Jadeja are three slow bowling options. Jasprit Bumrah will lead the attack with other specialist pacers Mohammad Shami and Bhuvneshwar Kumar. The selectors didn’t choose to go with the variety of left-arm seamer Khaleel Ahmed who has been part of the Indian side of late. “We also discussed Khaleel and Navdeep Saini, they will be around and if the need arises one among them will be there,” Prasad added. The planning for the World Cup had started after the Champions Trophy. Prasad said that the team management, trainers and physio Patrick Farhat are in constant touch with the IPL franchises to manage the work load of Indian players.